Caroline’s Bikini is a novel about unrequited love that seeks to establish itself in the tradition of extended imaginative pieces of text – poetry or prose – that in themselves are an attempt to create an artefact or ‘thing’ that may stand in for the love object. If the love may not be possessed, then, says the tradition, we have this piece of work to stand for it. The piece of work is real – we can touch it, read it, respond to it – and it has a physicality that the missing object of desire does not. The beloved may not be possessed, but her story can be, and a text created from it, that can be held and kept and returned to. Caroline stayed. She was there, just the same, in all the fullness, reality, of her self and name. Caroline. Throughout all the words, all the paragraphs, all the sentences, she was just . . . present. In the midst. You know those lines by Petrarch writes? ‘So I, alas, my lady, sometimes roam,/seeking in other faces you alone,/some semblance of the one true form . . .’? Well, that just about sums it up, what Evan was doing. Months had passed since our story had begun. This essay of ours, these pages of words. A long time, the changes of season charted in sections or chapters, I hadn’t decided yet how they would be arranged, yet now here we were stuck, is how it felt, like a machine gets stuck mid-action, and can’t sort itself, can’t click into gear to start up its whirring and turning again but only spins, over and over, brokenly and pathetically in the same place. The reader of Gunn’s novel might share Emily’s irritation, as Caroline’s Bikini never really goes anywhere, if you don’t count the hilarious last scene. But that is the point, even if it requires some patience from the reader: the point is the stasis, the mindlessness of courtly love in a 21st-century context. The gradual fall of Evan is farcical to follow, as he moves from suits to sweatpants while declaring his love for an unattainable woman. 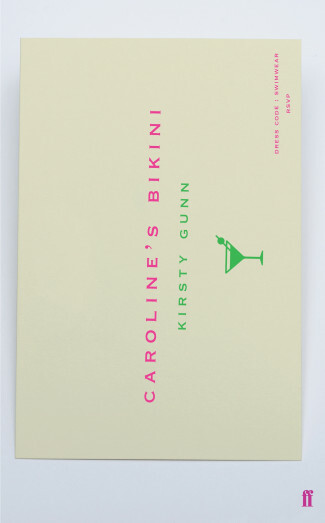 Caroline’s Bikini is, indeed, subtle, and one of the weirdest and most experimental novels I have come across all year. Emily herself doubts the project’s nature as a novel throughout the, well, novel by Gunn: sometimes it’s considered an essay, sometimes an intervention, a project, a story… This year’s Goldsmiths Prize has a strong contender right here. There are many ways to approach Gunn’s text. For example, you could skip to the end of the book to read the analytical non-fiction bits about Caroline’s Bikini without ever spoiling the plot. However, I like to consider it a novel that is read from the beginning to the end in the order it is presented, which was a functional choice too: “Some Further Material” is surprisingly fascinating to read even after the main story is finished. It is as plotless as the body text, but addictive for any reader who, like me, finds pleasure in perusing, dissecting, and analyzing literary texts. Caroline’s Bikini is a metatextual whirlwind that is bound to annoy some readers and delight those who don’t mind postmodern tricks in their books.